She inherited the Kingdom on High and is ever glorified! The Holy Martyr Photina (Svetlana) the Samaritan Woman, her sons Victor (named Photinus) and Joses; and her sisters Anatola, Phota, Photis, Paraskeva, Kyriake; Nero's daughter Domnina; and the Martyr Sebastian: The holy Martyr Photina was the Samaritan Woman, with whom the Savior conversed at Jacob's Well (John. 4:5-42). During the time of the emperor Nero (54-68), who displayed excessive cruelty against Christians, St Photina lived in Carthage with her younger son Joses and fearlessly preached the Gospel there. Her eldest son Victor fought bravely in the Roman army against barbarians, and was appointed military commander in the city of Attalia (Asia Minor). Later, Nero called him to Italy to arrest and punish Christians. Sebastian, an official in Italy, said to St Victor, "I know that you, your mother and your brother, are followers of Christ. As a friend I advise you to submit to the will of the emperor. If you inform on any Christians, you will receive their wealth. I shall write to your mother and brother, asking them not to preach Christ in public. Let them practice their faith in secret." St Victor replied, "I want to be a preacher of Christianity like my mother and brother." Sebastian said, "O Victor, we all know what woes await you, your mother and brother." Then Sebastian suddenly felt a sharp pain in his eyes. He was dumbfounded, and his face was somber. For three days he lay there blind, without uttering a word. On the fourth day he declared, "The God of the Christians is the only true God." St Victor asked why Sebastian had suddenly changed his mind. Sebastian replied, "Because Christ is calling me." Soon he was baptized, and immediately regained his sight. St Sebastian's servants, after witnessing the miracle, were also baptized. Reports of this reached Nero, and he commanded that the Christians be brought to him at Rome. Then the Lord Himself appeared to the confessors and said, "Fear not, for I am with you. Nero, and all who serve him, will be vanquished." The Lord said to St Victor, "From this day forward, your name will be Photinus, because through you, many will be enlightened and will believe in Me." The Lord then told the Christians to strengthen and encourage St Sebastian to peresevere until the end. All these things, and even future events, were revealed to St Photina. She left Carthage in the company of several Christians and joined the confessors in Rome. At Rome the emperor ordered the saints to be brought before him and he asked them whether they truly believed in Christ. All the confessors refused to renounce the Savior. Then the emperor gave orders to smash the martyrs' finger joints. During the torments, the confessors felt no pain, and their hands remained unharmed. Nero ordered that Sts Sebastian, Photinus and Joses be blinded and locked up in prison, and St Photina and her five sisters Anatola, Phota, Photis, Paraskeva and Kyriake were sent to the imperial court under the supervision of Nero's daughter Domnina. 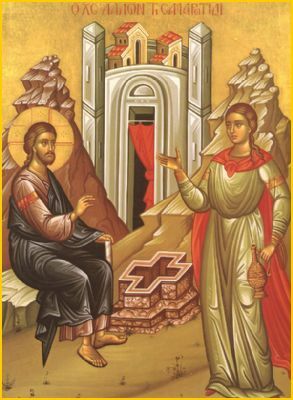 St Photina converted both Domnina and all her servants to Christ. She also converted a sorcerer, who had brought her poisoned food to kill her. Three years passed, and Nero sent to the prison for one of his servants, who had been locked up. The messengers reported to him that Sts Sebastian, Photinus and Joses, who had been blinded, had completely recovered, and that people were visiting them to hear their preaching, and indeed the whole prison had been transformed into a bright and fragrant place where God was glorified. In an impotent rage Nero gave orders to flay the skin from St Photina and to throw the martyr down a well. Sebastian, Photinus and Joses had their legs cut off, and they were thrown to dogs, and then had their skin flayed off. The sisters of St Photina also suffered terrible torments. Nero gave orders to cut off their breasts and then to flay their skin. An expert in cruelty, the emperor readied the fiercest execution for St Photis: they tied her by the feet to the tops of two bent-over trees. When the ropes were cut the trees sprang upright and tore the martyr apart. The emperor ordered the others beheaded. St Photina was removed from the well and locked up in prison for twenty days. After this Nero had her brought to him and asked if she would now relent and offer sacrifice to the idols. St Photina spit in the face of the emperor, and laughing at him, said, "O most impious of the blind, you profligate and stupid man! Do you think me so deluded that I would consent to renounce my Lord Christ and instead offer sacrifice to idols as blind as you?" Hearing such words, Nero gave orders to again throw the martyr down the well, where she surrendered her soul to God (ca. 66). On the Greek Calendar, St Photina is commemorated on February 26.